The first chapters are written for readers with no programming experience with later chapters being more suitable for advanced or professional programmers. 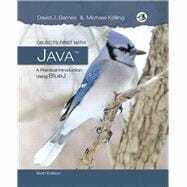 The Java programming language and BlueJ—the Java development environment — are the two tools used throughout the book. BlueJ's clear visualization of classes and objects means that readers can immediately appreciate the differences between them and gain a much better understanding of the nature of an object than they would from simply reading source code. Unlike traditional textbooks, the chapters are not ordered by language features but by software development concepts.